Celtic won narrowly to extend their lead at the top of the Scottish Premier League despite a below-par performance at home against St Mirren. After a lacklustre first half the home side made three changes in an attempt to inject more cutting edge to their game in the second period. It eventually paid off on 79 minutes when substitute Kris Commons fired in a low drive from 20 yards. St Mirren's John Potter missed a good close-range chance in added time. The win takes Celtic onto 73 points at the top of the SPL table, five ahead of Rangers, who are inactive until they travel to play their game in hand against Hamilton Accies on Sunday. The hosts had come into the game off the back of a 3-1 midweek win over in-form Hibernian, but the performance in the opening 45 minutes was a far cry from that clinical display. Manager Neil Lennon, serving the last game of his touchline ban, would have noted down just one real chance for his men. That came after half-an-hour when Anthony Stokes rose to meet Cha Du-Ri's cross from the right-hand side, and the Irishman's header from seven yards went narrowly past the St Mirren post. Other than that Celtic were sloppy in possession and struggled to get in behind a very well-organised Saints defence. Beram Kayal, Celtic captain for the afternoon, and Ki Sung-Yeung in particular were guilty of wasteful passes. And as the home crowd grew restless Ki and Charlie Mulgrew resorted to efforts from distance, which never troubled Paul Gallacher in the visitors' goal. Instead, it was St Mirren, perhaps enjoying renewed confidence after winning their last two games, who looked more comfortable, and they had better chances to break the deadlock. Michael Higdon watched a glancing header go across goal after 13 minutes, and then Steven Thompson had a glorious opportunity from Kenny McLean's cut-back. But the Saints midfielder swung his foot and completely missed the ball from an excellent position just 10 yards from Fraser Forster's goal. Shortly before the break, Celtic's James Forrest showed more urgency, taking the ball in from the right wing, and beating a couple of players before steering a shot past the far post. But St Mirren had the last chance of the half, when Higdon was afforded acres of space at a corner, drifting away from his marker before badly scooping his shot over from around the penalty spot. Shaun Maloney was given his first taste of action for more than four months after the break, with Gary Hooper making way having had a quiet game. The home side began to show much more intent, putting St Mirren under some sustained pressure, but still they failed to really test Gallacher. And although the league leaders made tracks down the wings, their crosses were often poor, and when Emilio Izaguirre burst through the middle from left-back his attempt to slip the ball through to Maloney was overhit and the move broke down like so many others. With Ki and Ljungberg proving largely ineffectual, they were replaced by the more regular first XI pairing of Joe Ledley and Commons. And the change paid off, as shortly afterwards Commons gave Celtic the goal which, until then, had looked unlikely for the hosts. Maloney received the ball 18 yards out, dragged it across the box before laying it off to Commons who rattled a first-time shot low inside the post from around 20 yards. As the game drew to a close, St Mirren's Potter was inches away from a spectacular equaliser with a rasping shot from 25 yards which flew just over the bar. And the Saints defender had a wonderful chance to level in added time, but he lashed a left-foot volley wide from just seven yards after Celtic had failed to clear a corner. 92:59 The referee blows for the end of the match. 90:00+0:04 Effort on goal by John Potter from deep inside the penalty area misses to the right of the target. 89:37 Free kick awarded for a foul by Joe Ledley on Jim Goodwin. Jim Goodwin takes the free kick. 88:32 Foul by Marc McAusland on Anthony Stokes, free kick awarded. Direct effort from the free kick comes in from Anthony Stokes. 87:40 Gareth Wardlaw gives away a free kick for an unfair challenge on Beram Kayal. Direct free kick taken by Fraser Forster. 85:28 Corner taken by Jure Travner from the left by-line, Glenn Loovens makes a clearance. 85:01 Unfair challenge on David Barron by James Forrest results in a free kick. John Potter restarts play with the free kick. 84:33 James Forrest produces a left-footed shot from just outside the penalty box that goes wide left of the target. 83:58 Handball decision goes against Marc McAusland. Kris Commons takes the direct free kick. 82:57 Free kick taken by Fraser Forster. 82:57 Booking Darren McGregor is shown a yellow card for unsporting behaviour. 82:51 Darren McGregor concedes a free kick for a foul on Glenn Loovens. 80:34 Inswinging corner taken by Jure Travner. 80:34 Substitution Hugh Murray leaves the field to be replaced by Gareth Wardlaw. 80:34 Substitution David Barron on for Lee Mair. 79:57 Hugh Murray delivers the ball, clearance made by Charlie Mulgrew. 77:46 Assist by Shaun Maloney. 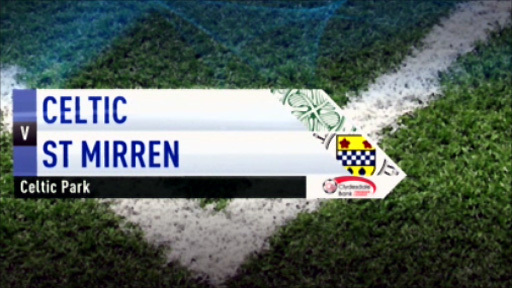 77:46 GOAL - Kris Commons:Celtic 1 - 0 St Mirren Kris Commons gets on the score sheet with a goal from just outside the area to the bottom left corner of the goal. Celtic 1-0 St Mirren. 76:16 Centre by Shaun Maloney, Paul Gallacher makes a save. 71:37 Substitution Jure Travner replaces Kenny McLean. 70:40 The ball is delivered by James Forrest, save by Paul Gallacher. 69:45 Substitution Kris Commons replaces Fredrik Ljungberg. 69:17 Corner taken left-footed by Emilio Izaguirre from the left by-line, Headed effort from close range by Charlie Mulgrew goes wide left of the goal. 69:11 The ball is crossed by Emilio Izaguirre, Hugh Murray gets a block in. 68:21 Michael Higdon has a shot on goal from outside the box which misses right. 65:11 Corner from left by-line taken by Fredrik Ljungberg. 65:06 The ball is crossed by Emilio Izaguirre, blocked by Lee Mair. 62:49 Fredrik Ljungberg produces a cross, clearance by John Potter. 62:04 Corner taken right-footed by Fredrik Ljungberg from the left by-line, save made by Paul Gallacher. 60:47 Substitution Joe Ledley replaces Sung-Yeung Ki. 59:39 Hugh Murray sends in a cross, Glenn Loovens manages to make a clearance. 59:07 Effort on goal by Du-Ri Cha from outside the box goes harmlessly over the bar. 57:42 Emilio Izaguirre sends in a cross. 57:26 The ball is delivered by Emilio Izaguirre, clearance by Darren McGregor. 56:54 Free kick awarded for an unfair challenge on Beram Kayal by Steven Thomson. Direct free kick taken by Fredrik Ljungberg. 55:50 The official flags Fredrik Ljungberg offside. Paul Gallacher takes the free kick. 54:51 The ball is crossed by Sung-Yeung Ki. 53:44 Foul by Glenn Loovens on Michael Higdon, free kick awarded. Free kick taken by Hugh Murray. 52:51 Inswinging corner taken from the left by-line by Sung-Yeung Ki. 52:45 The ball is delivered by James Forrest, clearance by Marc McAusland. 52:00 Free kick awarded for an unfair challenge on Fredrik Ljungberg by Jim Goodwin. Sung-Yeung Ki delivers the ball from the free kick right-footed from left channel, clearance by Darren McGregor. 51:12 James Forrest crosses the ball, Shaun Maloney produces a right-footed shot from the edge of the area and misses to the left of the target. 49:45 Unfair challenge on Beram Kayal by Lee Mair results in a free kick. Charlie Mulgrew takes the free kick. 48:32 Outswinging corner taken right-footed by Sung-Yeung Ki from the right by-line, clearance made by Jim Goodwin. 48:27 James Forrest sends in a cross, blocked by Jim Goodwin. 46:44 The ball is crossed by Du-Ri Cha, clearance by John Potter. 46:12 The assistant referee flags for offside against Michael Higdon. Indirect free kick taken by Glenn Loovens. 45:01 Substitution Shaun Maloney comes on in place of Gary Hooper. 45:00+1:11 The first half comes to an end. 43:49 Outswinging corner taken right-footed by Patrick Cregg played to the near post, Effort on goal by Michael Higdon from inside the area goes harmlessly over the bar. 43:40 Steven Thomson delivers the ball, blocked by Emilio Izaguirre. 40:23 James Forrest crosses the ball, clearance made by Jim Goodwin. 38:09 Close range header by Charlie Mulgrew goes over the bar. 37:34 Hugh Murray gives away a free kick for an unfair challenge on Fredrik Ljungberg. Direct free kick taken by Sung-Yeung Ki. 36:28 James Forrest has an effort at goal from just inside the box that misses to the left of the target. 35:00 The offside flag is raised against Kenny McLean. Indirect free kick taken by Fraser Forster. 34:03 Sung-Yeung Ki has an effort at goal from just inside the box that misses to the right of the goal. 32:10 The ball is sent over by Emilio Izaguirre. 29:35 Free kick awarded for an unfair challenge on Jim Goodwin by Charlie Mulgrew. Paul Gallacher takes the free kick. 29:03 Inswinging corner taken by Sung-Yeung Ki from the left by-line, clearance by Darren McGregor. 28:56 A cross is delivered by Fredrik Ljungberg, Darren McGregor manages to make a clearance. 28:09 The ball is crossed by Kenny McLean. 27:51 A cross is delivered by Kenny McLean, Charlie Mulgrew manages to make a clearance. 26:51 The ball is sent over by Du-Ri Cha, Anthony Stokes produces a header from close range which goes wide of the left-hand post. 25:14 The ball is delivered by Steven Thomson. 21:48 Free kick awarded for an unfair challenge on Hugh Murray by Charlie Mulgrew. Marc McAusland restarts play with the free kick. 19:58 Unfair challenge on Gary Hooper by Darren McGregor results in a free kick. Direct free kick taken by Du-Ri Cha. 19:33 Free kick awarded for an unfair challenge on Jim Goodwin by Gary Hooper. Darren McGregor restarts play with the free kick. 17:41 Emilio Izaguirre takes a shot. Paul Gallacher makes a save. 17:19 Beram Kayal delivers the ball, Lee Mair makes a clearance. 16:44 Centre by James Forrest, clearance made by Hugh Murray. 13:50 Hugh Murray sends in a cross, Michael Higdon has a headed effort at goal from deep inside the area missing to the left of the target. 11:57 The referee blows for offside. Free kick taken by Glenn Loovens. 11:32 The offside flag is raised against Gary Hooper. Paul Gallacher takes the indirect free kick. 9:56 Unfair challenge on Beram Kayal by Kenny McLean results in a free kick. Free kick taken by Du-Ri Cha. 4:09 Effort on goal by Kenny McLean from just outside the penalty area goes harmlessly over the target. 3:25 Foul by Du-Ri Cha on Michael Higdon, free kick awarded. Michael Higdon produces a shot on goal direct from the free kick. 2:06 Centre by Du-Ri Cha, blocked by Patrick Cregg.